The SymbolPalette displays a collection of palettes. The Palette shows a set of nodes and connectors. It allows you to drag and drop the nodes and connectors into the Diagram. 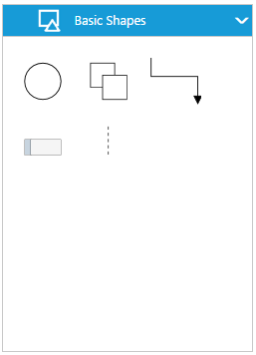 The DiagramId property of symbolpalette should be set with the corresponding Diagram ID to drag and drop the nodes and connectors into the Diagram. The following code illustrates how to create symbolpalette. A palette allows to display a group of related symbols and it textually annotates the group with its header. To initialize a palette, define a JSON object with the property Name that is displayed as the header text of palette. The Expanded property of palette allows to expand/collapse its palette items. You can add any number of palettes to the Palettes collection of the symbol palette. 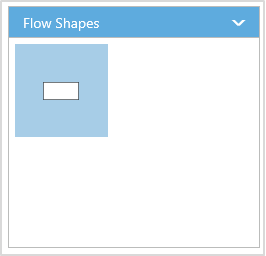 The following example illustrates how to define symbol palette with a palette object that is defined in the previous step. The following image shows the symbol palette with multiple palette Items. Palettes can be annotated with its header texts and you can change the height of palette header by using HeaderHeight property of symbol palette. Also, you can embed any HTML element into a palette header by defining the ScriptTemplate id to palette’s templateId property. Following code example illustrates how to customize palette headers. The symbol need to be defined and added to the Items collection of the palette. 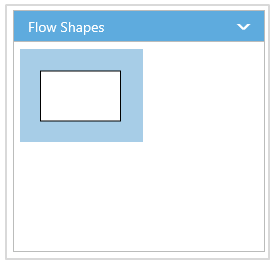 You can create a symbol as a node, group, connector, lane, or phase except swimlane. The following code example illustrates how to define a palette with symbols that are defined in the previous section. You can customize the size of the individual symbol. The PaletteItem property of node enables you to define the size of the symbols. The following code example illustrates how to change the size of a symbol. Symbol size will be set based on the following precedence. Symbol size will be rendered in the palette based on Node.PaletteItem’s Width and Height property. If PaletteItem’s Width and Height property is not specified, symbol size will be rendered in the palette based on model’s PaletteItemWidth and PaletteItemHeight property. If you don’t specify above two, then symbol size will be rendered in the palette based on node’s Width and Height property. The EnableScale property of the paletteItem enables you to customize the size of the symbol regardless of the precedence. 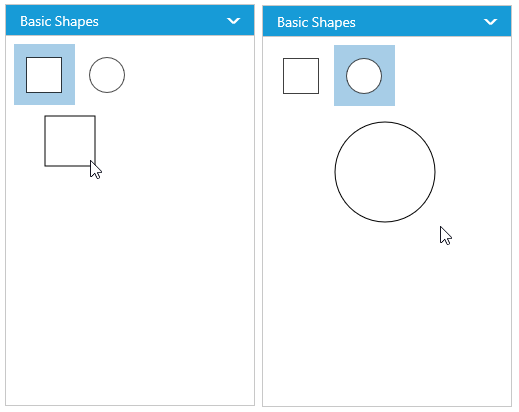 The following code example illustrates how to customize the symbol size. You can customize the preview size of the individual palette items. 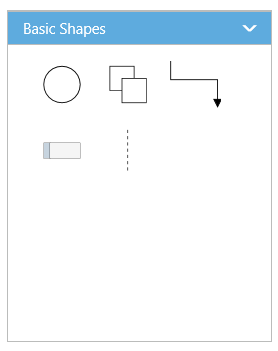 The PaletteItem property of node enables you to define the preview size of the symbol items. The following code example illustrates how to change the preview size of a palette item. You can also customize the preview size of the all palette items. The PreviewWidth and PreviewHeight property of SymbolPalette enables you to define the preview size to all the symbol palette items. The following code example illustrates how to change the preview size of a symbol palette items. 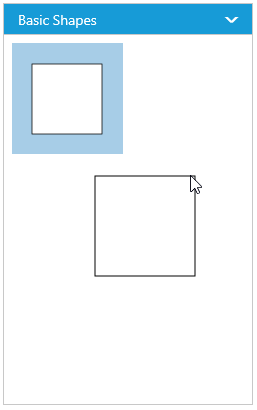 Symbol palette allows to sets the offset of the dragging helper relative to the mouse cursor. Symbol preview size will be set based on the following precedence. Symbol preview size will be set based on node.paletteItem’s PreviewWidth and PreviewHeight property. 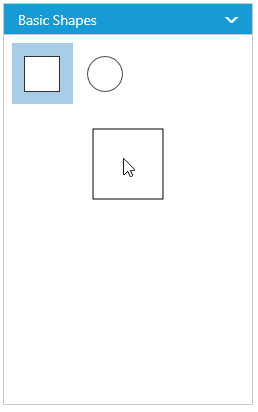 If paletteItem’s width and height property is not specified, symbol size will be set based on model’s PreviewWidth and PreviewHeight property. You can show/hide the symbol text by using the ShowPaletteItemText property of symbol palette. To explore the properties of symbol palette, refer to Symbol Palette Properties.